Our 20 yard dumpster rental is by far the most requested dumpster rental we have because of its ability to handle large or small jobs. This size dumpster is considered as a medium size dumpster choice but it is a rather large dumpster rental that can take on pretty large scale projects. 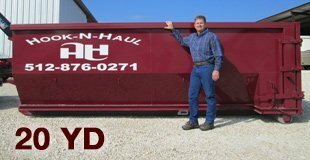 This dumpster is ideal for a large home remodeling project, or a commercial type project. This is a larger dumpster for a driveway but will fit, just make sure that you have cleared the driveway prior because it will take up the majority of the space. A good way of measuring what this dumpster can hold is roughly 8 truck loads of material. This is a safe bet for a dumpster rental when you have a medium to large size project. 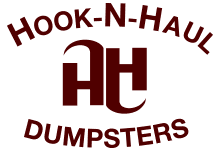 However don’t be shy to ask us for our opinion because we may be able to save you a couple of bucks by assisting you with the right size of dumpster rental for your home project or commercial project.